Our Scholarship Program Just Got Bigger! Thanks to the generous donations from our members, more students passionate about travel medicine can now apply for an IAMAT scholarship. We’ve just expanded our International Travel Medicine Education Program to Hainan Medical University in Haikou, China where two more students will now be able to train in travel medicine. This new partnership complements our existing travel medicine scholarship training site at the Kaiser Permanente Honolulu Clinic in Hawaii. 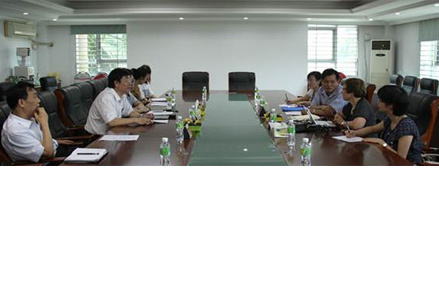 IAMAT President, Assunta Uffer-Marcolongo, second on right, meets with Hainan Medical University staff and Vice President Zeng Yu, second on left. Photo courtesy of Hainan Medical University. The IAMAT Scholarship Fund is the only one of its kind supporting doctors and nurses from low income areas and typically popular tourism destinations – to study and train in travel medicine abroad. This unique program provides scholars with the knowledge and practice to become certified practitioners in travel medicine. Upon graduation, scholars return to their home country to lend their expertise in travel medicine clinical best practices, elevate local health care standards, teach their colleagues, and expand the network of IAMAT affiliated clinics around the world to benefit international travellers, including fellow citizens travelling abroad. Hainan Medical University is host to international students from all over the world. Since its inception in 1993, students from 150 countries have been taught by professors and staff who have studied and trained abroad. It is the only university in China offering a degree in tropical medicine. Located on the island of Hainan in the South China Sea, Haikou and the surrounding area are a popular international vacation destination with much need for travel medicine providers. Our goal was always to expand our scholarship and grant program. In May, during a trip to southeast Asia to inspect IAMAT affiliated clinics, president Assunta Uffer-Marcolongo visited Hainan Medical University to explore the possibility of expanding the scholarship program. Under the guidance of Professor Huamin Wang and his staff, the university is now accepting scholarship applications for this independent course offered through their medical program. The two chosen IAMAT scholars will take courses in microbiology, immunology, environmental health, emergency medicine, epidemiology, disease prevention, international travel medical insurance, international travel and health, and food safety and hygiene. All courses are taught in English. Wondering what the goals of the IAMAT Scholarship Fund are? – Pre-travel health advice for international travellers. – Attending to the medical needs of travellers away from home. Foster leadership skills for scholars to become a travel health resource person in their country. Promote cross-cultural exchanges of medical knowledge, processes, and procedures. Practice English language skills necessary for accurate communication. Prepare scholars for certification in travel health. Hainan Medical University: 2012 IAMAT-Hainan Travel Medicine Scholarship. To contribute to the IAMAT Scholarship Fund, you can donate here.